Last week’s Boston victory may have marked the end of baseball season, but the Sox, along with Harvard’s own baseball team, won’t stop working hard, or be forgotten by their many fans any time soon. This now-esteemed sport has not always garnered favorable reactions, however—particularly from former Harvard President Charles William Eliot. Eliot was also a vocal critic of football and other sports. Were the university to have followed Eliot’s athletic as well as academic dictums, Harvard might still only offer rowing and tennis, the two athletic activities he deemed honorable. 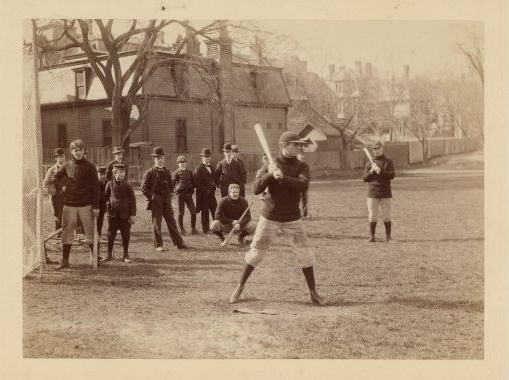 This photo depicts a Harvard baseball practice circa 1898, during Eliot’s tenure; its players, though clad (surprisingly) in turtlenecks, are sporting familiar baseball caps.